Thanks Fredmans and gunslinger007 for the feedback. Its always a great feeling to get some feedback on a list. Seems the teleporting from the strike cruiser is pretty popular which sounds great to me. Also just want to point out Ive already dropped the list back to strat 5. Any Ideas of how to word it? Should formations have to teleport the turn the strike cruiser is coming on? Teleporting numbers chews into the allowable amount to drop pod in or a separate amount on top of the 20 allowed?? I think limiting the buffed teleport to the turn the strike cruiser arrives makes sense. And I assumed the numbers would combined with drop pod for a combined 20 max. Made sense to me as a maxed out space on the ship. Combined, the rules really limit access to the buffed teleport. However, that might be a good balance with Thawks back in the list allowing for air assaults. I'm interested to see what other's thoughts are. What are people using to proxy in the Dreadknights? I was eyeing up Vanguard's Novan Elite Breacher Seige Harness, but figured I'd ask if anyone had comparison photos or other models they thought fit the bill. Thanks! Ive attempted to write something up for the buffed teleporting. Shouldn't be to bad, could either pod in with coordinates or teleport anywhere but lose the death wind and a small risk of blasts. Also dropped the dread knights to 3+ armour. I put in an order for the Seige Harness and figured I'd float a comparison picture out there for anyone else with the same questions. I'm pretty happy with how it scales! Ace model by Vanguard. 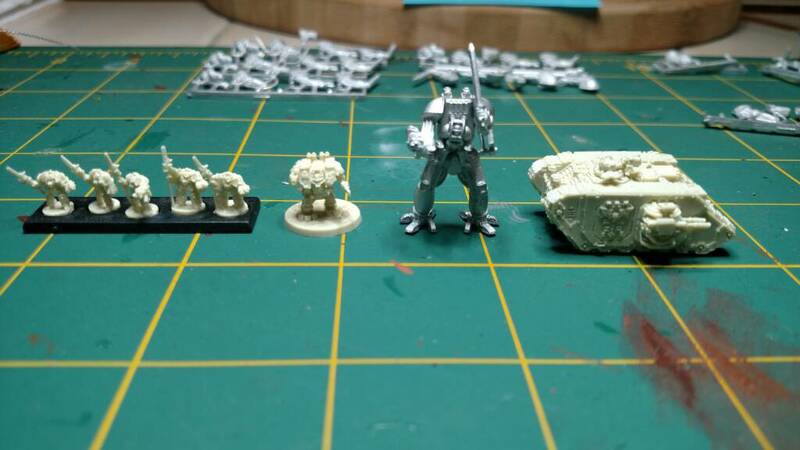 Left to right: FW terminators; FW dreadnought; Vanguard Seige Harness; FW land raider. Woahhhhhh they look great. Great dreadknight proxy. I was torn between this and the Skinnerz stompy thing or mashing them together. I just love the clunky servo bits on the back of the Skinnerz harness. Hey Norto, quick question for you on the new "teleport rule." I'm hoping to confirm/correct my understanding. Three units can teleport: Interceptors, Terminators, and Dreadknights. With the Teleport Homer rule, are they all restricted to teleporting from the Strike Cruiser? Or does Cruiser restriction only apply if they want the benefit of rerolling 1s, but they can still teleport w/o a Cruiser if they want to with the traditional risks? Yeah so to benefit from rerolling 1s is from the strike cruiser on the turn of the strike cruiser, but can teleport normally. But you need to declare when setting up the spacecraft what's loaded in it as normal. If its deemed to good when can limit it to just the spacecraft deck. Was painting up some talons tonight. I just need to get a tabletop gaming happening to get some action pics. You'll have to post some pics up on Taccom. Hopefully you'll motivate me to start getting some paint down! Yo bud, trying to figure out any pain points for this list and using the Agents of the Imperium vassal extension. Anything critical missing? First time I've had a look at the list, seems interesting. One question tho, which may have impact on the way I'll be doing Dark Angels: Am I correct that Grey Knights can teleport anywhere from the Strike Cruiser, and get to re-roll 1:s? In Dark Angels I've mostly copied the E-UK teleport homer (which is a unit ability on the Ravenwing Land Speeders and Attack Bikes that allow units within 15cm to re-roll their dice). I've expanded this to also allow Teleporters to teleport in close to the Teleport Homers when the Space Ship arrives... Or at the start of any turn as normal. In this list it seems like the Teleport Homer is something the Terminators themselves have. Not necessarily a problem that the rules are different, but with the similar names there might be some confusion. Thanks for checking it out. Definently keen to keep consistency with special rules like this. I'll jump over and check yours out and try and copy it. Or maybe we come to a compromise to keep simplicity for tournament goers. The playtest I've had so far with the Dark Angels Teleport homer has been inconclusive, it definitely requires more manouvering than the Grey Knights version, as you need to first get some Ravenwing formations in place, and *then* get in the Space Ship and teleport people down. But since I have Deathwing Knights in the list, maybe that's needed. Another idea would be to extend the range of the teleport homer to 30cm. 15cm might be too close to be really useful. In addition to the Ravenwing, I've been thinking about giving the Dark Angels Captains access to Teleport Homer. I see Grey Knights are swarming with captains... Maybe that could be a place to put Teleport Homers in your list? Maybe the Storm Ravens could have it too, since the list doesn't have any land speeders.